Staff Sgt. August O’Niell, an Air Force pararescueman, briefs members of the Air Force Technical Applications Center about how he sustained significant warzone injury, which led to the amputation of his leg, and how he overcame adversity during AFTAC’s Combat Airman Fitness Day May 22, 2017. O’Niell is the first Air Force pararescue amputee on active duty today. Those were the words of Staff Sgt. August O’Niell, an Air Force pararescueman, to members of the Air Force Technical Applications Center when the combat warrior visited the base to discuss resiliency during the center’s Combat Airman Fitness Day. 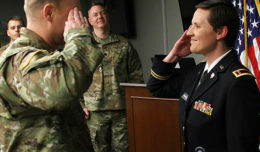 AFTAC commander Col. Steven M. Gorski invited the Purple Heart recipient to speak after learning of a connection between O’Niell and another member of the treaty monitoring center, Kevin Callan. Callan has known Auggy (as he’s fondly known by his inner circle) since 2001, and thought he’d be a perfect candidate to inspire AFTAC personnel during their quarterly CAF Day events. Once Gorski learned of O’Niell’s amazing story of courage, he told Callan to do what he could to have him come speak. In July 2011, O’Niell was on a rescue mission in Afghanistan when his helicopter came under fire from enemy insurgents. Several rounds pierced the chopper, with one tearing through O’Niell’s lower limbs. 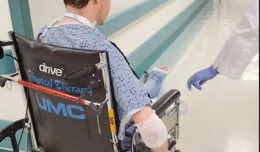 His left leg was severely wounded, and after nearly two dozen surgeries, immeasurable pain and a desire to stay on active duty, he opted to have his left leg amputated above the knee. 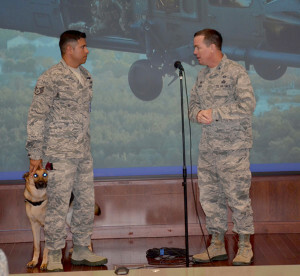 Col. Steven M. Gorski (right), commander of the Air Force Technical Applications Center, Patrick AFB, Fla., expresses his admiration to Staff Sgt. August O’Niell, the first Air Force pararescue amputee, during AFTAC’s Combat Airman Fitness Day May 22, 2017. 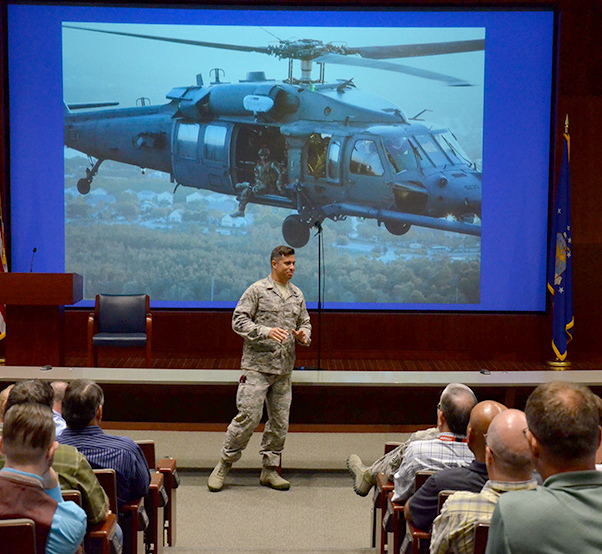 O’Niell spoke to the nuclear treaty monitoring center personnel about resiliency and overcoming adversity. Kai has been a part of O’Niell’s life since shortly after his accident. K9 Soldiers is a non-profit charity dedicated to improving the lives of military servicemen and women by providing them with fully-trained dogs to assist with everyday challenges. Kai was at O’Niell’s side throughout his visit to AFTAC – a first for the center. The audience laughed when Auggy warned them about how Kai reacts to applause. “I just want to let you know he has his own way of clapping along when he hears others doing it!” And O’Niell wasn’t joking – when the crowd erupted in applause after his presentation, Kai popped up on all fours and began to howl and bark. After nearly two dozen surgeries, countless hours of rehab, and a drive to return to active duty to rejoin his PJ brethren, O’Niell began the process to requalify and recertify as a pararescueman. His decision to amputate his leg not only helped alleviate his pain, but cleared the way for him to meet a medical board for consideration to return to the job he loves. Staff Sgt. August O’Niell, the U.S. Air Force’s first pararescue amputee to continue to serve on active duty, speaks to members of the Air Force Technical Applications Center, Patrick AFB, Fla., during the center’s Combat Airman Fitness Day May 22, 2017. 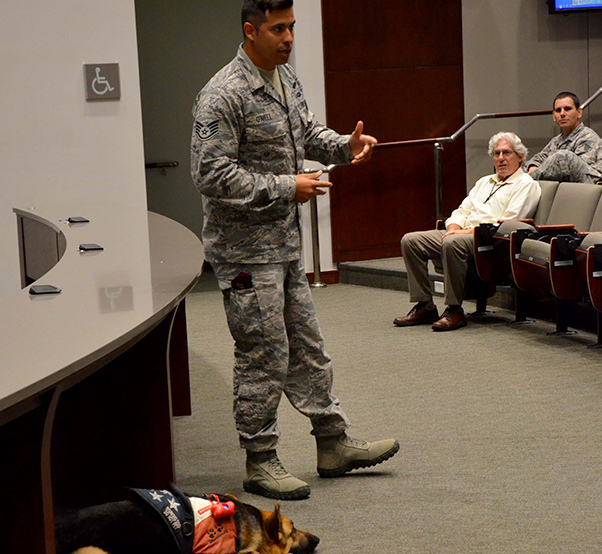 Pictured with O’Niell is his loyal companion, Kai, a service dog who O’Niell obtained through the K9 Soldiers program. His competitive spirit was evident during his participation at the Invictus Games in 2016. He rappelled from a helicopter during the games’ opening ceremonies in front of 10,000 spectators and television viewers around the world, with Kai anxiously waiting for him at the center of Champion Stadium in Orlando, Fla. He competed in swimming, and earned a Gold Medal in sitting volleyball. He’s also a five-time Warrior Games gold medalist. During his presentation, O’Niell quoted the pararescue motto during his presentation, ‘These things I do, so others may live.’ Gorski agreed there is no greater sacrifice than someone willing to lay down his life to protect others. “He is a testament to every aspect of the Air Force Core Values, and it was a privilege to have him visit the center,” he said. O’Niell is the only pararescue amputee serving on active duty in the Air Force.